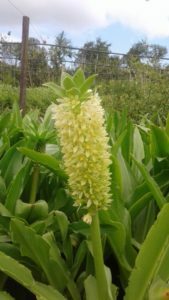 One of the most fascinating and unusual perennial bulbs that you will come across, this hardy and exquisite summer flowering plant is a must for every South African garden. 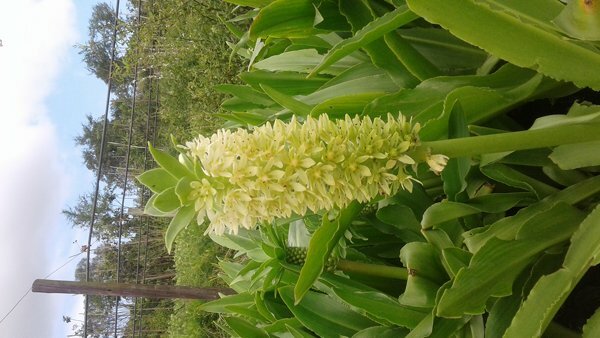 The Pineapple Lily takes its epithet from the peculiar, long lasting floral display, and has three equally beautiful subspecies occurring in our country. Its lengthy, cylindrical flowerhead, supported by a stout and fleshy stem, is cloaked with hundreds of creamy, golden-white, starry flowers that open gradually from the bottom upwards, turning green as they develop. The magnificent flowers are followed by lovely, ornate seed capsules. At the base of each of these stately bulbs rests a rosette of handsome, lance shaped, wavy-edged, waxy green leaves. The large spikes of rich yellow flowers are crowned with a tussock of bright, lime-green, leaf-like bracts. A truly unique, dignified geophyte that deserves to be planted more often, and is also showing an alarming decrease in numbers in the wild. These bulbous perennials occur in damp grasslands, shady forest and woodlands areas, as well as wet, rocky regions mainly in the southern and western parts of South Africa. 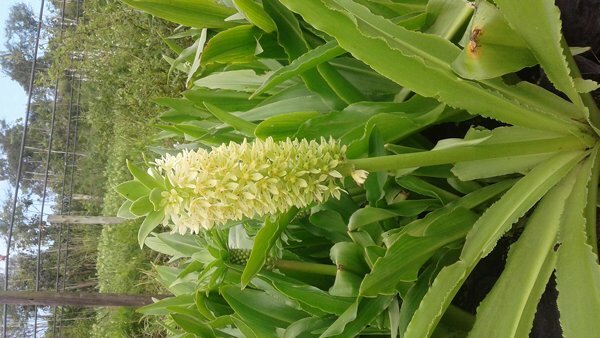 They often form dense strands in their natural habitat, and can be found from the coast to altitudes of about 2400 m.
The Autumn Pineapple Lily can be found in nearly all the Cape provinces, as well as Mpumalanga, Limpopo, Natal, sheltered parts of Gauteng and the Free State, North West and through to Zimbabwe. This species has a large, elliptic-oval bulb (80-100 mm diameter), with thickset, fleshy roots, that supports a sturdy, erect stem. From this bulb, a nearly ground-level rosette of annual, waxy, broad (140-550 x 35-130 mm), delicate yet fleshy leaves are produced, each clasping the stem tightly. 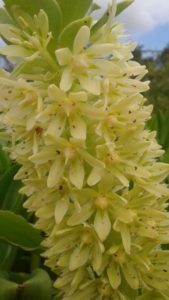 The leaves are a bright, pale to deep yellow-green, hairless, and have slightly undulating, tightly scalloped or finely toothed margins. A faint crease or channel can often be observed running lengthways along the middle of the leaves. 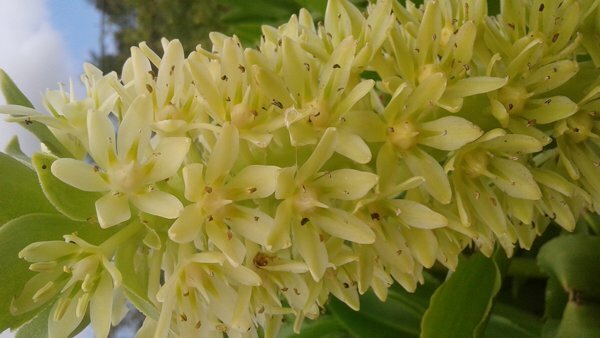 A most unusual, single, elongated cylindrical flowerhead, supported by a robust, fleshy stem, consisting of more than 100 individual (15-20 mm), star-shaped, greenish to yellowish-white flowers. The inflorescence is typically crowned with an additional tuft of greenish, leaf-like, broad and blunt-tipped, terminal bracts. These protective bracts tend to fold inwards, creating deep, short channels that angle upwards and spread outwards. The flowers turn bright green once fertilisation has occurred, and make way for three-chambered, capsuled fruits. Each capsule contains numerous spherical, glossy black seeds. 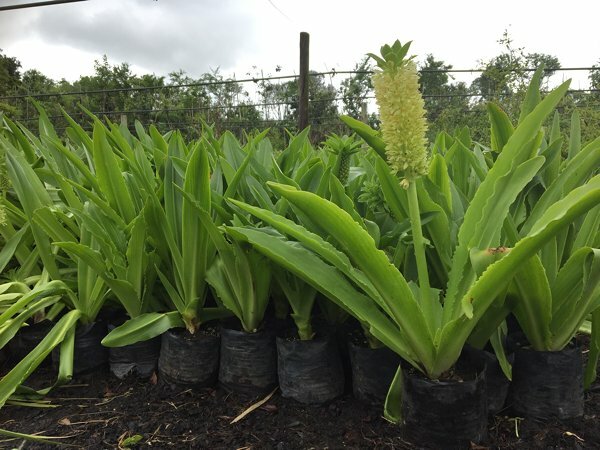 Although the bulb does contain toxic compounds, it has been used against a variety of ailments in traditional medicine, as it contains several flavonoids (known for their anti-inflammatory qualities), and steroidal triterpenoids (beneficial in wound therapy). Concoctions of the bulb, usually made with water or milk, are said to help ease pain (especially lower backache) and speed up the recovery of fractures and wounds. These concoctions are usually administered as enemas. Numerous other ailments are also treated with infusions of the bulb, including urinary and pulmonary diseases, stomach disorders, colic, fever, syphilis and biliousness. A brew is also made from the bulb that is said to provide a cure for hangovers, and this infusion is used to treat bladder and kidney problems. The leave are made into a dressing that is applied to boils and other skin aberrations. To provide protection from evil and illness, the pulverized bulb is mixed with animal fat, then smeared into the body. Cattle diseases are also treated using concoctions of the bulb. A variety of birdlife will be attracted by this unusual bulbous plant. The flowers attract nectar-feeding birds, and many insectivorous birds will in turn be lured by the multitude of insect life the pollen-rich flowers entice. Butterflies, bees, wasps, beetles, flies, moths and many more insects will flock to the flowers. A most beautiful, unusual and highly interesting garden subject, VERY easy to grow, pest-resistant, relatively water-wise and requiring little to no maintenance to look its best. These bulbs look spectacular when planted in large groups and make a lovely addition to a rockery. As they are clump forming, they can be used to add life and beauty to large open and unused spaces and are tolerant of shady conditions. They are ideal container plants and make stunning focal or accent plants. In colder climates, they are perfect for planting in large pots in conservatories, and also look amazing if planted next to a wall or other permanent structures (which will also afford some protection from the cold). The flowers, whether left on the plant or cut and placed in a vase, are very long-lasting. It has a high decorative value, not only for its superb floral display, but also the capsuled fruits that follow the flowers. An easily cultivated species that, once established, requires very little extra maintenance to look its best. They can tolerate poor and very sandy soils, but these maty negatively affect flower development. 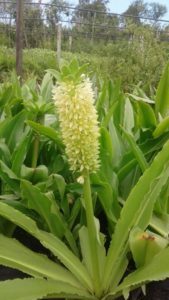 Eucomis is frost hardy to at least -5 C, but only once well matured and established, when they have formed dense clumps. In areas where frost is known to be severe, try to plant them in a sheltered position, and cover the surrounding area with a protective layer of mulch or a similar substance. Keep them as dry as possible, especially in winter when they are dormant, to prevent extra damage. They reach maturity at 3-5 years of age, depending on their external environments. The plants prefer a sunny position. Part shade will be tolerated, but growth and flowering will be adversely affected. They prefer a nutrient rich, water-retentive but VERY well-drained, loose peaty or loamy soil, with a slightly acidic ph. They will accept chalky and sandy soils but benefit from an added liquid fertiliser once in spring when growth is at its peak. In the summer months, while they are in the active growing phase, they must be watered regularly, but they prefer to be kept dry in winter, when they are dormant. Easily grown from seed or offsets and leaf-cuttings taken in the winter dormancy period. Seeds should be sown in springtime, preferably in deep containers filled with a well-drained medium of river sand and compost (2:1). Germination is usually fair and even and should occur within 1-2 months. The seedlings are a tad slow growing and should not be transplanted until at least 3 years of age. Many bulbs grown from seed may only produce flowers after their fourth season. When transplanting, plant the bulbs with their tops at or just below ground level (not more than 15 cm deep). Offsets should also be planted in spring but should only be taken from the parent plant in winter. Leaf-cuttings (4-6 cm), can be taken while the plant is in active growth, and placed into a sterile and well-aired soil with a bit of added compost. These should be placed in a temperate, humid place and misted often. Growth will appear after a few months. This plant is not suited for outdoor growing unless you are in in a mild and temperate area.